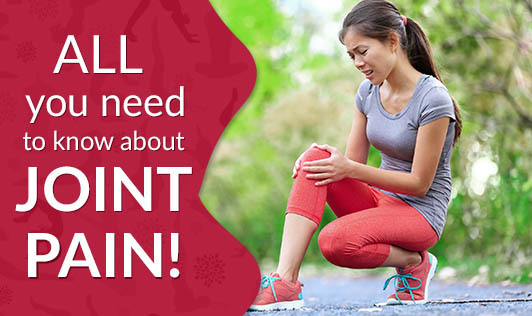 All You Need To Know About Joint Pain! Joints form the connections between the bones. Joint pain is caused when there is damage to the joints from disease or injury affecting the ligaments or tendons that interfere with your movement and in turn cause a lot of pain. No matter what, joint pain can be very bothersome. Joint pain can range from mildly irritating to debilitating. It may go away after a few weeks (acute), or last for several weeks or months (chronic). Infectious diseases like mumps, chickenpox, influenza, hepatitis, measles, rheumatic fever etc. Warm baths, massages should be done frequently. Exercises like swimming, yoga, walking and stretching exercises with the consult of physician and physiotherapist is most important. Proper posture should be maintained while sitting, walking and lying down. Rest the joint, avoid any activities that cause you pain. Have healthy foods with good amounts of fruits and veggies that have antioxidants and vitamins. Most important is that if you are overweight - reduce your weight with the right diet and regular exercise as it might relieve the pressure on your painful joints! !